Quilt along with Christa using a walking foot and also learn free-motion techniques to create fabulous quilts--from start to finish--on your home sewing machine. Award winning quilter, Christa Watson, shows you how with 8 different walking-foot designs and 10 free motion quilting motifs, plus 12 inventive patterns to put all the quilting techniques to use! 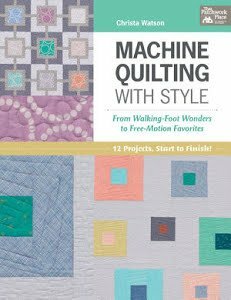 Love the look of free-motion quilting but not sure where to begin? Start with ample stipples and expand your repertoire to include wandering waves, boxes, pebbles, loops, and many more. Discover Christa's top tips for machine quilting success and learn to use quilting design to enhance each part of the quilt, whether you're making a baby quilt, wall quilt, or throw.